Samsung Gear S2 With Rotating Bezel Official! Samsung has been teasing their new smartwatch for a while now and today the company has finally taken the curtains off their new pair of Tizen based smartwatches. Yes you read correctly, pair, meaning two. 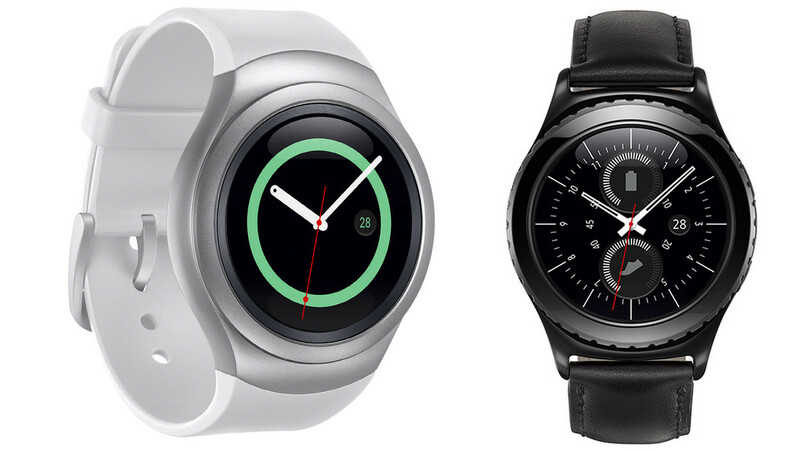 The devices are officially named the Gear S2 and Gear S2 Classic. Both smartwatches are identical in terms of specifications hence it is easy to distinguish what the target audience for each is. The S2 classic is an attractive looking gadget which has a black case along with a black leather band while the regular S2 features a Dark Gray case with a Dark Gray band and Silver case with a White band. Samsung’s press release says, “The Gear S2 Classic is made for users who prefer a more timeless watch design” whilst the regular Gear S2 has a more ultra modern and minimal design. The coolest part feature of the new watches arguable is the rotating bezel which can be used to navigate the user interface alongside touch. The devices also have a home and back button for added convenience. Speaking of convenience, Samsung claims that the 250mAh battery on both devices should last between 2-3 days on a single charge which when compared to most Android Wear offerings (and the Apple Watch) is great news. Furthermore the watches are charged wirelessly via a dock that will come in the box with the S2. We do not know what wireless charging technology is being used by Samsung but chances are it is Qi and PMA compatible like the Galaxy S6 and Note 5. As the Gear S2 runs on Tizen, it does not have access to the large variety of apps that Android Wear has. Nevertheless, Samsung states that they have a number of sweet applications built in and are working to expand the Tizen app library. As of now, we do not know if the watches will run exclusively on Samsung smartphones similar to the predecessors. Recently though, Google has opened up Android Wear to run on iOS thus we can speculate Samsung will enable wider compatibility to stay in competition. The new smartwatches include IP68 dust and water resistance (meaning the devices can be submerged in 1 metre of water for 30 minutes) which by the way is not available on the Apple Watch. NFC is also on board for use with mobile payment systems. An interesting note, a version of the Gear S2 has 3G connectivity which incorporates the first-ever e-SIM with voice capability, to perform quick functions without being closely tethered to their phone. There is no word on the availability of this particular version yet. The Gear S2 will be demonstrated in Berlin on the 3rd of September where we hope to learn more details and get an ideo of how the software on board will work. No pricing information, availability or release information has been release yet. The Gear S2 upon first impressions has already set itself apart from the competition with its unique rotating bezel. The battery life is promising too and the 1.2inch full circle AMOLED display (302ppi) is sure to offer a good viewing experience. Both the devices look attractive too and have a host of compelling features. My main concern lies within compatibility and app support. Samsung has kept their Gear devices restricted to its own smartphones in the past and I fear this will happen again. Since Android Wear is not on board, many users may think twice before purchasing as there is no guarantee on how deep the app support will be. At the end of the day, the Gear S2 and S2 Classic appear to be very promising devices. Samsung has to play its cards right to ensure these are successful, stupid moves such as restricting compatibility will definitely hurt it in the long run. Stay tuned for more details as IFA 2015 rolls up.